Prohibition was not one of Newark’s grandest eras. One reporter described a Newark that 'glittered like the mouth of hell' during the Prohibition era. Not even Manhattan Island had more speakeasies to the square mile. Historian John T. Cunningham viewed it as 'not a shining era in Newark or anywhere else in the nation,' for it was an open secret that gangsters and politicians worked hand-in-hand. What's more, policemen often were unable to find illegal speakeasies despite the fact that almost anyone who wished could be admitted to these haunts by securing a membership card. As a result of this general retreat from Puritan ethics and Victorian convictions, crime of all sorts was on the increase. Respect for elected officials dwindled and police credibility was called into question. It was an era that saw the entrenchment of crime in communities large and small nationwide, tempered eventually by the Great Depression and the outbreak of World War II. The age of speakeasies and roadhouses, rum running and vice spawned the emergence of nationally known gangsters including Capone, Saperstein, Lansky, Anastasia and Luciano. In Newark, Dutch Schultz and 'Longie' Zwillman were the bigwigs. It was a dangerous time, an exciting time and a lawless time, a colorful epoch that began in the Roaring Twenties. Prohibition was the source of many of the problems that followed. Between 1920 and 1933 it curtailed the manufacture, transportation and sale of alcoholic beverages in the United States. Its origins date to the last century and the Anti-Saloon League. With the passage of the 18th Amendment to the U.S. Constitution, it became a national mandate, yet its enforcement proved impossible and brought about a series of events that changed the country. On the roof of the old Kresge's Department Store the large P.O.N. (Pride of Newark) brewery sign now had new reason for burning. For the first time in more than a decade, the freshly polished copper vats at the Krueger Brewery were filled with beer. The statue of King Gambrinus, the mythical German god of beer, again became the symbol of beer production in a beer-consuming city. Prohibition's legacy to New Jersey's largest city was several fold. Newark was a plum, and a rich and prosperous one at that, whether manifested in big-time criminal activity or an ordinary stop by a local gin mill. With Prohibition came the emergence of the speakeasy, which was different from the colonial tavern, the old-fashioned saloon, or more modern cocktail lounges. Essentially, it symbolized a more sinister side of the era, one fraught with rival gangs ready to kill to protect their mini-kingdoms. More often than not, big-time gangsters were known and feared, locally and nationally. In old Newark, Arch Gifford's Tavern at Broad and Market streets not only was a place to eat and sleep, it was also a stagecoach stop for trips to New York, Jersey City or Philadelphia. Later, 19th century saloons were scattered along Broad and Market streets, establishments such as Iffland's, which served hard-boiled eggs, pigs knuckles cooked in wine, frankfurters and knockwurst, along with a nickel beer. Similar establishments included Ludwig Achtel-Stetter's bar near the Central Railroad Station and Charlie Charles' saloon at the Four Corners, a favorite rendezvous for politicians and attorneys. Speakeasies were designed to provide a safe haven while getting an illegal drink without being hassled by either the law or potentially dangerous customers. Writer Bill Gordon's 1960s interview of a former speakeasy owner described such a place in the Ironbound as 'just a little room in the back.' This particular speakeasy had a huge mirror from the old Clark Thread Mill Club in Ogden Street, a large bar without stools and lots of small tables and chairs for the customers. A buzzer announced the arrival of potential guests. 'Then we'd look you over through a window in the second floor to okay the customer,' the owner said. 'If we didn't know you, well, then you wouldn't get in.' Liquor or booze often was made in the cellar, then blended with the 'imported stuff.' 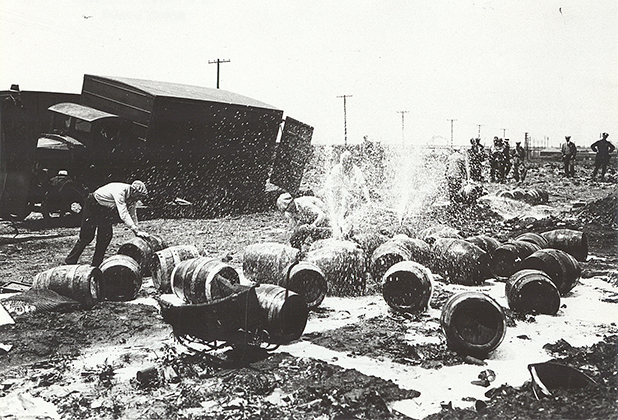 No precautions were necessary when Prohibition was repealed in 1933. The need for secrecy died with the law. While the speakeasy was the lighter side of the activities of the time, the gangs were certainly the dark side of the era. The bullet-riddled body of Louis B. Saperstein, victim of a gangland shooting, was indeed no joke. A man in his 40s who had been an insurance broker with political connections, he held a $5,000 a year position with the Newark City Fund Insurance Commission until 1945. His association with a failed Newark bank and friendship with Joseph 'Doc' Rosen, one-time Newark bootlegger, was questionable. When he was pulled before a New York grand jury to testify, this proved too much. Somebody did him in. Because of the overlapping gangland jurisdictions and the possibility of open gangland warfare, Al Capone 'thought it would better to end the projected Newark war' with a two-day conference held here. Infamous Dutch Schultz, whose real name was Arthur Flegenheimer, was born in the Bronx, where he spent most of his early criminal career before moving to New Jersey and was eventually bumped off. His career began as a bartender. Soon, he controlled many bars in the Bronx and Manhattan. But his big opportunity came when he set up and ran the first numbers racket in Harlem some years later with the help of his friend and financial wizard Otto 'Abbadabba' Herman, whose mathematical calculations eventually made him rich. Schultz was known for unbridled ruthlessness and overpowering cheapness. Almost everyone who knew him feared him, and with reason. During his career he employed and later murdered Jack 'Legs' Diamond and Vincent 'Mad Dog' Coll. When he discovered he was being defrauded by George Winbert, it was rumored he was so angry that he killed Winbert with his bare hands. Other say he plugged a bullet into Winbert's brain or 'fitted him out with a cement overcoat and dropped him into the Hudson River while he was still alive.' The federal government tried to charge Schultz with murder, but failed. Then it attempted to convict him of tax evasion. To counter the move, Schultz relocated to upstate New York, where the trial was held. The charges against him were dismissed. Upon his return to the metropolitan area, Schultz tried to revive his old criminal empire. But a newly appointed special prosecutor, Thomas Dewey, was determined to thwart the effort. To stop Dewey, Schultz suggested his assassination. 'Lucky' Luciano replied: 'It'll bring down the heat on all of us.' Schultz, therefore, decided to go it alone. At this point, the New York crime syndicate allegedly issued a contract on Schultz. During dinner at his favorite Newark restaurant, the Palace Chop House on Park Street, he was shot to death, along with his three companions. This classic gangland slaying was considered a fitting end to a man who lived by the gun. One of America's most important crime figures, Abner `Longie' Zwillman rose from humble beginnings on Newark's Broome Street to become the warlord in a vast regional crime empire. Zwillman was feared as well as respected, rich, and generally opposed to open violence. As one of the nation's top crime figures, he often was referred to as the Al Capone of New Jersey. He knew every American gangster, and they knew him. Zwillman's rise to fame was gradual, taking him from his roots in a poor Russian immigrant family in the old Jewish Third Ward to a 20-room mansion on Beverly Road in West Orange. This would-be gangster kingpin left school at 13 to help support a widowed mother and four siblings. During Prohibition he ran 'a vast bootlegging enterprise that brought him a fortune as well as a past he could not escape in later life. Zwillman was associated with, and is reputed to have been part owner, in gambling enterprises at the Riviera Hotel in Havana and similar operations in Bergen County. A New York mayor once described him among the six most important crime figures in the area and also linked him to Murder Incorporated, a ring of hired thugs and gangland executioners. He also was accused of jury tampering, a charge which continued to plague him throughout his life. Following the death of Dutch Schultz, he was thought to be the most important gangland figure in New Jersey. Later, when asked during the McClellan Senate hearings if he was the Al Capone of New Jersey, he responded: 'I don't intend to be. I never strive to, and I am trying to make a living for my family and myself. But rumors go around. They accuse me of owning the place. I walk into a restaurant and I own the restaurant. I walk into a hotel and I own the hotel. I take a shine twice and I own the bootblack, too.' With the arrival of the 1950s, Zwillman was reported to have 'gone straight' by becoming involved in several legitimate businesses. For a short time he owned stock in the Hudson and Manhattan Railroad and was involved in the trucking business. He also is said to have acquired a General Motors franchise, had a financial interest in a washing machine and dryer company, owned several coin-operated laundromats, and was associated with cigarette vending machine companies in and around Newark. During this time, he donated $250,000 to a housing project in Newark near his boyhood home. On February 27, 1959, everything ended with the report of his suicide. Increased pressure from the Senate investigation committee, dissatisfaction within the criminal syndicate, and health problems may have contributed to his end. Was it a suicide or a murder? The questions persist to this day. Some think Zwillman was murdered. Yet the autopsy performed by Dr. Edwin Albano, the Essex County medical examiner, ruled his demise as 'suicide by hanging, death due to asphyxia and temporary insanity.' Thus the suave, polite, well-spoken, but powerful, complex and fateful life of Abner Zwillman ended.